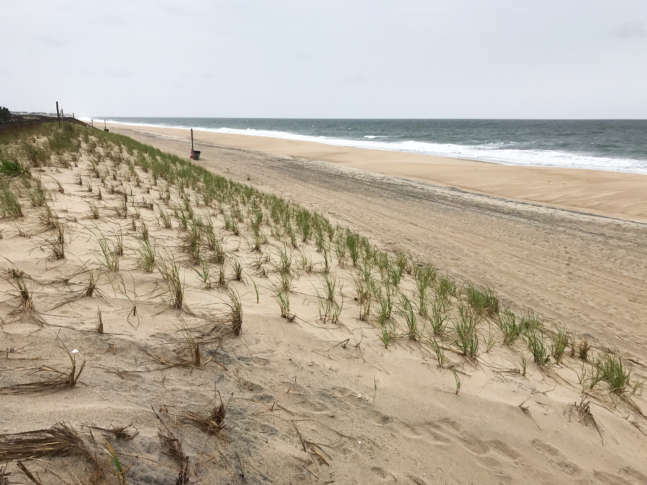 WASHINGTON — Those looking for a break from Beltway commutes and the commotion of the city retreat to Bethany Beach, where bike cruisers dominate the roads and the chime of emails are drowned out by the sound of crashing waves. Bethany Beach is known as the “quiet” beach, but that doesn’t mean there’s not a lot to do. Lauren Weaver, executive director of the Bethany-Fenwick Area Chamber of Commerce, said big events like the Poseidon Festival and daily programming on the beach and bandstand keep visitors busy all summer long. Plus, the town is home to some great restaurants and charming retail shops. 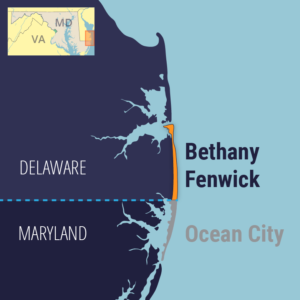 The Bethany-Fenwick area of Delaware sits directly north of Ocean City, Maryland, and is sandwiched between the Little Assawoman Bay and the Atlantic Ocean. During the summer months, the two neighboring beach towns see hundreds of thousands of visitors. If your summer plans include a tranquil trip to the Bethany-Fenwick beaches, use this guide — filled with tips from locals and those in-the-know — to navigate the area’s best activities and can’t-miss dining destinations. Workout on the water: Early risers have plenty to look forward to at Bethany Beach. The town hosts daily yoga classes on the bandstand and the beach daily (except for Thursdays) through Sept. 10. Bootcamp, Pilates and ninja warrior classes also take place on the beach throughout the summer. Costs range from $10 to $15 per person. Workout in the water: Dream of catching a wave? Now is your chance. Take a surf lesson in Bethany with RB Surf School or join a paddle board tour with Bethany Surf Shop. On Monday nights from 6 to 7 p.m., starting June 19, catch skimboard and bodyboard demos on the main beach. Pro riders will even offer some of their best tips for the water sports. Movies on the beach: June 11 through Aug. 27, end your days with a movie on the beach off Garfield Parkway. This summer’s screenings include everything from “The Lion King,” to “Coco.” Friday nights in September, the movies move to the bandstand. Entertainment for all ages: From concerts with Alison Krauss and Smokey Robinson, to documentaries and comedy shows, you’ll find all forms of entertainment at The Freeman Stage at Bayside. (There are also free kids shows, to be announced.) Dickens Parlour Theatre puts on live magic shows and is another favorite venue in the area — especially on rainy days. Meet me at the bandstand: The bandstand is the place to be in Bethany. Catch free concerts on Fridays, Saturdays and Sundays in the summer at 7:30 p.m. Kids’ nights are every Wednesday in July, plus there are a handful of special performances throughout the season. Shopping: Bethany’s boardwalk is lined with ice cream parlors, candy stores and beach shops. The town is also home to several high-end boutiques and galleries. “There’s just such a unique feel for the boutique shops in Bethany — just a little bit of something for everybody,” Weaver said. 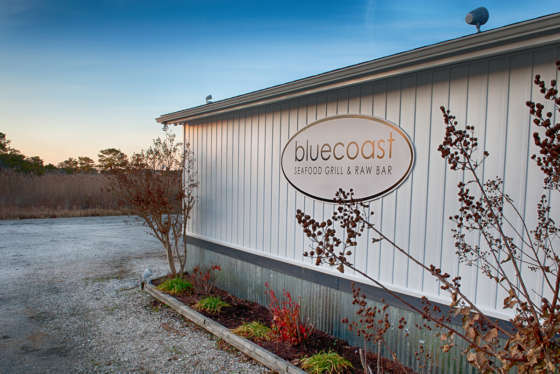 Agriculture is one of the biggest industries in Delaware’s coastal region, and that bounty is obvious when it comes to eating in Fenwick and Bethany. Sure, the area has a handful of casual diners and grab-and-go pizza joints, but those who prefer white tablecloth establishments that focus on farm-to-fork (and sea-to-spoon) dining will not be disappointed. One of the stars in the area is Sedona in Bethany Beach. Weaver said The Cottage Cafe, and Bethany Boathouse are also town staples. The Penguin serves all-day breakfast, and flanking the bridge to the Delaware Seashore State Park are two favorite spots for food and drink: Big Chill Beach Club and Hammerheads Dockside. In Fenwick, Weaver points to One Coastal and Just Hooked as go-to eateries for locals and visitors, alike. Those who prefer to picnic or cook have plenty of options for fresh, gourmet ingredients. Every day of the week, with the exception of Saturday, there’s a farmers market somewhere within a 10-mile radius of Bethany Beach and Fenwick Island. The Bethany Beach farmers market runs Sundays from 8 a.m. to noon June 3 through Sept. 2. The Fenwick Island farmers market runs Fridays from 8 a.m. to noon, June 17 through Sept. 8. Fenwick Island State Park: Visit this 344-acre state park between Ocean City and South Bethany for its quiet beaches and bay shoreline. There’s also hiking, kayaking and horseback riding in the offseason. Day-passes (which include parking) are $8. Independence Day Celebration: Bethany celebrates the Fourth of July with a parade, concerts and fireworks. Activities take place on the boardwalk and at the bandstand. Free festivals: The Poseidon Festival kicks off Memorial Day Weekend on the beach and bandstand. Expect entertainment and education for the sea-themed event. The 40th annual Bethany Beach Boardwalk Arts Festival takes place Sept. 8. Bethany Beach Nature Center: The Bethany Beach Nature Center offers children’s programming, indoor exhibits and outdoor education. Seaside Craft Show: The 14th annual Seaside Craft Show will be held June 2 from 10 a.m. to 5 p.m. in Bethany. Vendors along the streets and the boardwalk will showcase their works. Find more details on the event’s website. The majority of the lodging at Bethany Beach consists of condos, homes and bed-and-breakfasts. Weaver recommends visiting thequietresorts.com to review and book all available accommodations. Getting around Bethany Beach, which is 1 square mile, is pretty easy. Biking and walking are the preferred modes of transportation. (There are bike racks along the ocean entryways.) If you’re driving into town for the day, there is metered parking along the main streets, and experts recommend feeding the meter with the Parkmobile app, so you don’t have to give up your spot on the beach. A trolley also runs through Bethany Beach beginning the Friday before Memorial Day through mid-September from 9:30 a.m. and 10 p.m. The fare is just $0.25 each way. “If you’re staying in Bethany proper, you don’t even have to get in your car. It will take you right into town every day,” Weaver said about the trolley.